To give you a bit of background to this one here’s a quote from the incredibly informative book “An Overview of Australian Beatles Records” by Jaeson Jones: “In February 1973, to commemorate the 10th anniversary of the first Beatles record released in Australia (Please Please Me/Ask Me Why), EMI (Australia) repackaged the two previously issued Greatest Hits compilations into a double LP set with a new gatefold sleeve and distinctive purple labels. 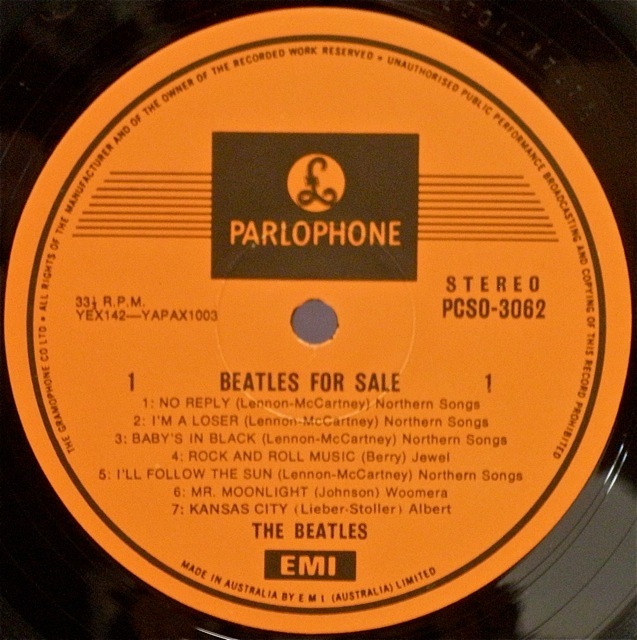 The LP was promoted nationally by member stations of the major radio network of Australia, with the front cover featuring a gold sticker on the top left displaying the call sign of the promoting station. The participating radio stations were 2KO, 2UE, 3DB, 4BK, 5AD, 6PR, 7EX and 7HT. 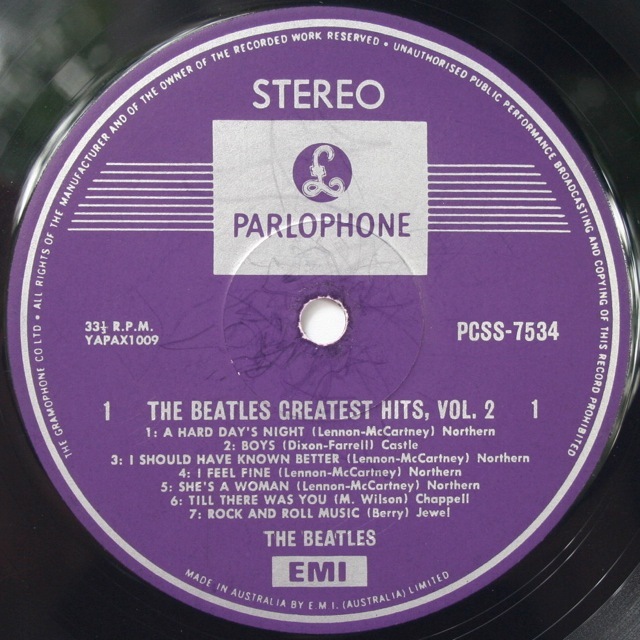 While there was no new content, or new mixes of old content, the labels eschewed the orange hue that characterised contemporary Beatles releases in favour of a more subdued lilac/purple colour; not a particularly earth-shattering variation perhaps, but one that undeniably adds to the unique character of the Australian Beatles labelography. As you can see on the first front cover image above, it also has the name of the person who owned it…. Linda Chinner – are you still out there? 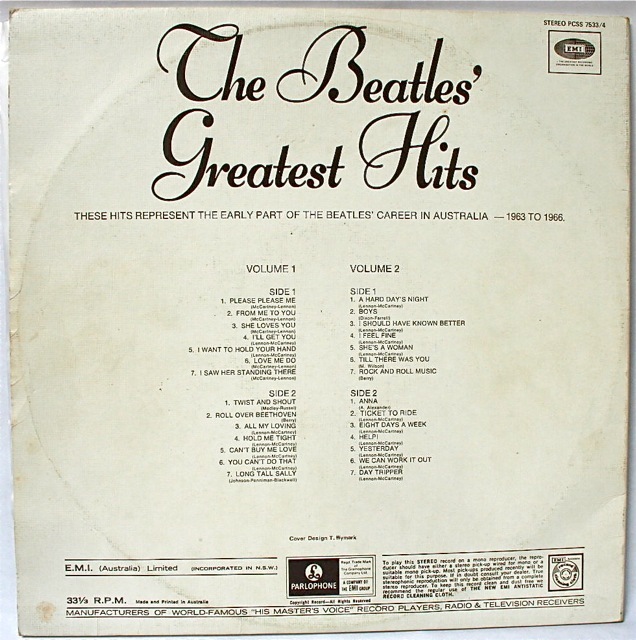 This entry was posted in Beatles, Beatles Collecting, Beatles Music, EMI Records and tagged Australian Beatles, Beatles, Beatles Collecting, Greatest Hits, Music by beatlesblogger. Bookmark the permalink. 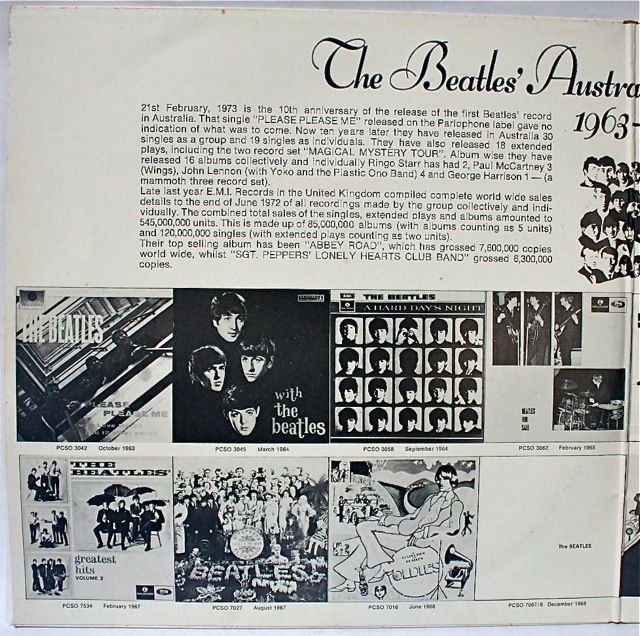 Call me a lot of attention to EMI Australia have chosen those images previously used on albums of the U.S. market for their collections, Beatles 65 and Beatles VI, always thought that Australians were ruled over the British matrix patterns. 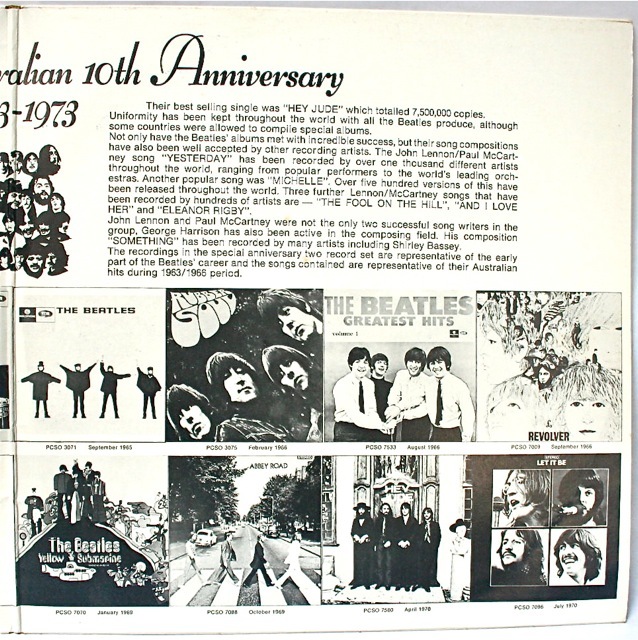 I have just been clearing my loft and found the copy of ‘the beatles 10th anniversary’ as described above which was brought to the UK in 1976. It is in pristine condition as it is still in the original plastic. Does anyone have an idea of value. I also have several original albums, some mono including Help and Revolver. Could anyone advise how to get valuations and sell these records. This album WAS my childhood. Don’t know if i would be a musician today if mum and dad didn’t have this. What a cracker. I used to love playing with the balance and hearing those crazy early stereo mixes. Awesome. How much would the anniversary one sell for if I happened to have one? Hi Steve, if it were in good condition (and they are hard to find because of the flimsy white cardboard they used for the cover) and if it had the radio station sticker still in place it could go for anywhere between about $40 – $80. Good condition examples with stickers from radio stations in small states sell for more as there were less produced. 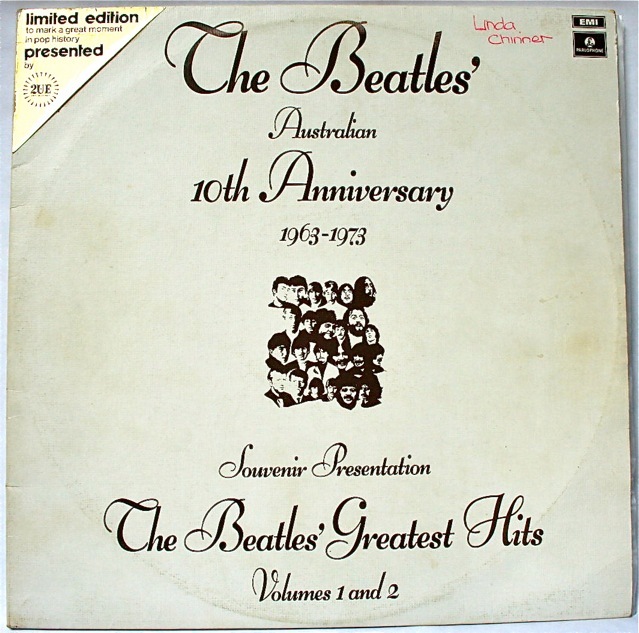 I have a radio station sample copy of The Beatles 10th Aniversary Australia album . What would it be worth ? Not selling , just wondered. Hi, sorry for the delayed response. I’d think if it were in very good condition (both the discs and the cover) then it would be worth around $40-50. Its hard to find these in good condition though because of the mostly white cover which is very flimsy and is prone to ring wear marks. Send us a photo if you can. And also let us know which radio station – because that also affects the value. 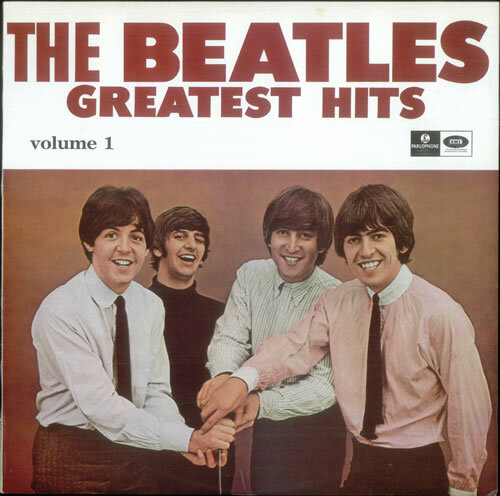 I have an original Beatles limited edition Australian 10th Anniversary 1963-1973 volumes 1& 2. With gold corner stamp presented by 6PR. Does anybody know which radio station 6PR is?? 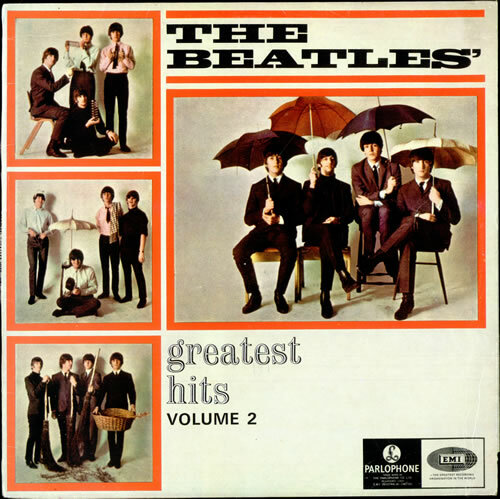 Back in the day it would have been a Top 40 station, hence the association with the Beatles for this release. Today it does news/talk programs. 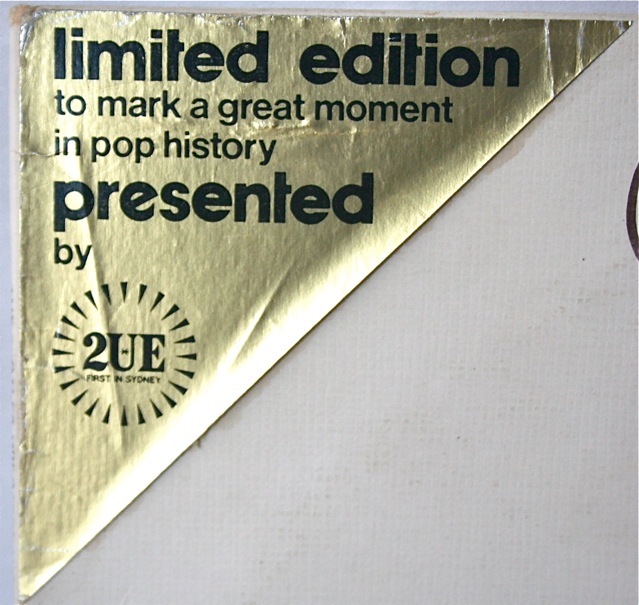 Those LPs all came with gold corner stickers – depending on which Australian state you purchased it in there would be a different radio station promoted. See http://www.beatlesaustralia.com/19_10THANNIV_index.html for more details, but the participating stations were 2KO and 2UE in NSW, 3DB in Melbourne, 4BK in Brisbane, 5AD Adelaide, 6PR Perth, and 7EX and 7HT in Tasmania.